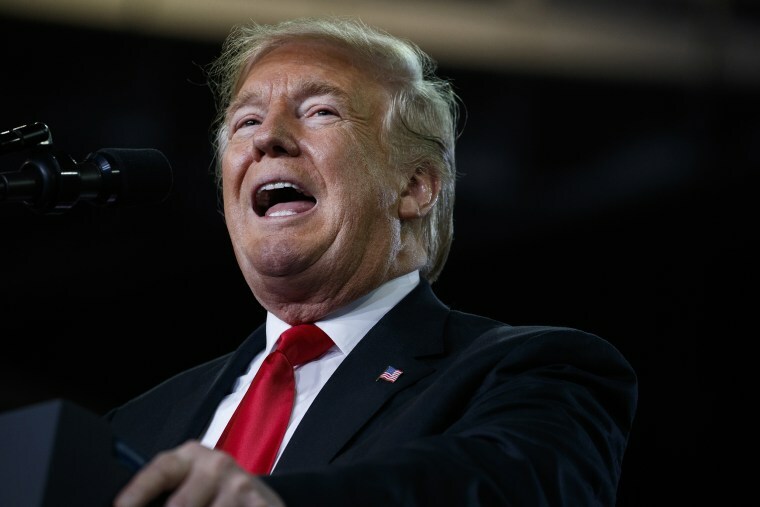 Trump's evidence-free allegation at a campaign rally in Erie, Pennsylvania, was an unusually direct claim against his 2016 rival. ERIE, Pa. — President Donald Trump directly accused Hillary Clinton of engaging in a conspiracy with Russia to affect the 2016 election during a campaign rally here Wednesday night. Special counsel Robert Mueller is currently investigating whether Trump or his operation colluded with Russia or obstructed justice afterward. But Trump allies in Congress and on cable news programs have argued that Democrats, Justice Department and FBI officials and the Clinton campaign conspired to frame him. Trump has discussed that theory publicly and on Twitter, but his remarks Wednesday night amounted to an unusually direct allegation that Clinton herself conspired with the Russian government to influence the election. He offered no evidence of his claim. Clinton spokesman Nick Merrill said Trump is in fantasy land. “Delusion, not collusion,” he said. Trump arrived at the Erie Insurance Arena as part of a barnstorming campaign in the final weeks before November's midterm elections just hours after Hurricane Michael barreled into the Florida coastline as a Category 4 storm. Trump told reporters he didn't want to disappoint his supporters by canceling the event, and he said at the rally that his administration is prepared to handle the aftermath of the storm. "We are all set to go," he said. Erie County, situated on the Great Lake of the same name, has a special place in Trump lore because its voters flipped from supporting Democrat Barack Obama in the 2008 and 2012 presidential elections to giving him a boost as he became the first Republican to win the state since 1988. Trump won the county by two percentage points after Obama took it by 17 points in 2012. “In some ways, Erie county is a bellwether for the nation. It's a classic example of the type of districts that Trump managed to win in key areas around the Great Lakes: industrial past, struggling manufacture sector, fairly high degree of poverty and, more recently, there has been high unemployment,” said Joseph Morris, chair of the political science department at Mercyhurst University in Erie. Morris, who also conducts a poll of Erie County, found that in 2017, just a year after Trump’s election, the president’s popularity was already on the decline. Just 32 percent of voters approved of Trump, while 55 percent said they disapproved. “What I found with our poll is that Trump's approval rating, even just a few weeks after the election, was not good in Erie County. In subsequent months, his approval rating dropped even further. So what that tells me is I think it had everything to do with Hillary Clinton and that is the way I explained Donald Trump’s victory here,” Morris said. Some voters interviewed by NBC News at the rally Wednesday night said they're open to voting for a Democrat over Trump in the next election. Frustration with Obama on foreign policy was the reason Matt Vargo, who works at an area high school, gave for turning to Trump two years ago. He, too, said he hasn't made up his mind about the president's re-election bid. "I want to see who else is running," he said. "I like to look at the whole thing, get the whole picture before I say anything." Trump was ostensibly in Erie to campaign for a series of candidates, including Rep. Lou Barletta, R-Pa., who is running for U.S. Senate, GOP gubernatorial nominee Scott Wagner, and Republican Rep. Mike Kelly, who is the local congressman. But Barletta and Wagner are trailing badly in polls, and Kelly, whose race is considered somewhat competitive by most prognosticators, has a 95 percent chance of winning, according to FiveThirtyEight.com. Michael Caputo, who worked as a campaign aide to Trump in 2016 and remains a vocal surrogate in the media, said Trump was able to take care of multiple goals with the appearance here. He wanted to show loyalty to candidates who have backed him, the buzz from his rally reached media markets in eastern Ohio and western New York, where there are additional competitive races, and he knows how important Erie County was to his victory in Pennsylvania and how significant the state will be in determining his electoral fate in two years. "It's also important for the president to shore up Pennsylvania for 2020, and Erie PA is Trump country," Caputo said. He also noted that Trump was not too far from the district of New York Rep. Chris Collins, a Trump loyalist who is seeking re-election despite being under indictment. "There is no way on God’s green earth that the president is going to come to NY-27 because of that situation," but the spillover effect of media coverage could have a "marginal impact" on Collins' race, Caputo said. Lauren Egan reported from Erie. Jonathan Allen reported from Washington.